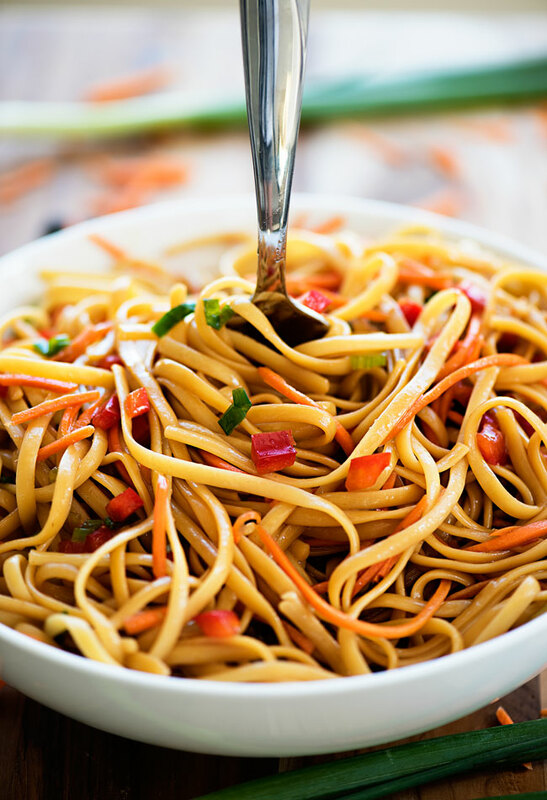 Asian Pasta Salad is full of flavor! The mixture of soy sauce and brown sugar add a wonderful salty sweetness and the veggies make it one delicious dish! I’ll never forget the first time I tried this ASIAN PASTA SALAD. My friend Jami brought it to one of our book club girls nights and I fell in-love at first bite. 😀 After I was finished with my second helping I begged Jami for the recipe. 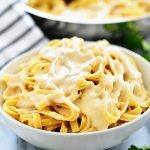 I needed this recipe in my life asap! She text it to me a few days later and I have been making it often ever since. 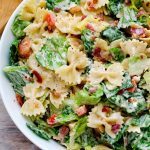 The flavors going on inside this pasta salad are so delicious. The mixture of soy sauce and brown sugar just take it to all levels of amazing. 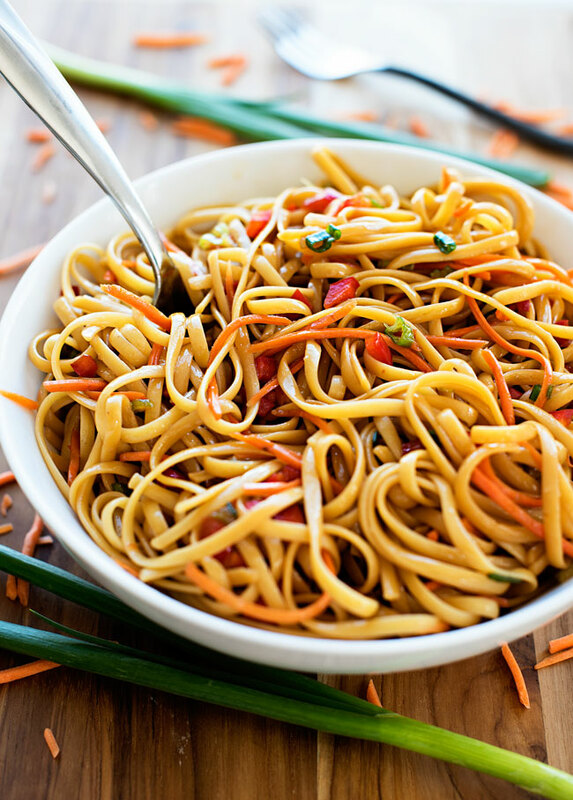 The added veggies along with the noodles make for one comforting and really flavorful dish. I like to make it one day in advance to really let the flavors meld together. 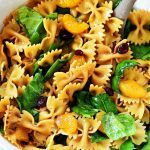 This is the perfect cold pasta salad to serve on a hot summer day. I guarantee it will be the first thing to go at any barbecue or picnic you serve it at! 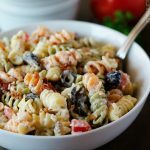 An incredibly flavorful and delicious pasta salad- perfect for summer barbecues and picnics! Do you think putting some chicken breast in the Asian would be good? I am trying to kill 2 birds with I dish. Maybe doubling the dressing? Yes I think adding some grilled or cooked chicken would make these even more amazing! I use Trader Joe’s brand of sweet chili sauce. But any should work fine! I love noodle salads especially when there’s Asian dressing involved. Hehe! My sister is driving through my city tomorrow & stopping for lunch and I bought all the ingredients to make this. YUM!! I was wondering though, would it be good served warm or is it much better cold? I’ve never had a cold noodle salad so I’m nervous. LOL! I served it cold! I had it in the fridge for 4 hours before hand. And it was SOOOOO good. My sister & her fiancé devoured it. My entire menu this week is from your blog. You never disappoint. THANK YOU! What brand of chili sauce did you use? Heinz chili sauce or franks chili sauce? I adore your Asian and Mexican recipes!!!! How to get the Dorito Taco Salad recipe please? Would olive or canola oil work instead of vegetable oil? I don’t have vegetable oil. This was a lovely dish. Beautiful flavours. Both my husband and I would definitely have this again. Thanks for a great recipe. Would olive oil work as a substitute for sesame oil? If not, can you recommend something else? Many thanks! Connie, sesame oil has a very strong and distinctive flavor that olive oil doesn’t have. I would suggest lightly toasting some sesame seeds in a skillet, stirring constantly because they burn quickly. You could add them to the dressing or garnish the top of the noodle salad with them before serving. Thank you so much for sharing this recipe. The sauce is really wonderful! I have everything chilling in the fridge and can hardly wait to dig into it. Thanks, too for telling us about Trader Joe’s sweet chili sauce. Oh my goodness, that stuff’s yummy with just enough heat to balance the sweetness. Wow I am very excited to make this. Generally I’ll try a recipe prior to having at a bigger function, however I’m so pumped with all the great reviews that it’s on the menu for the big bbq / air show next weekend. With all the versatile tastes and food preferences that go along with a crowd I am sure this is going to appeal to everyone. Not to mention easily tripled. 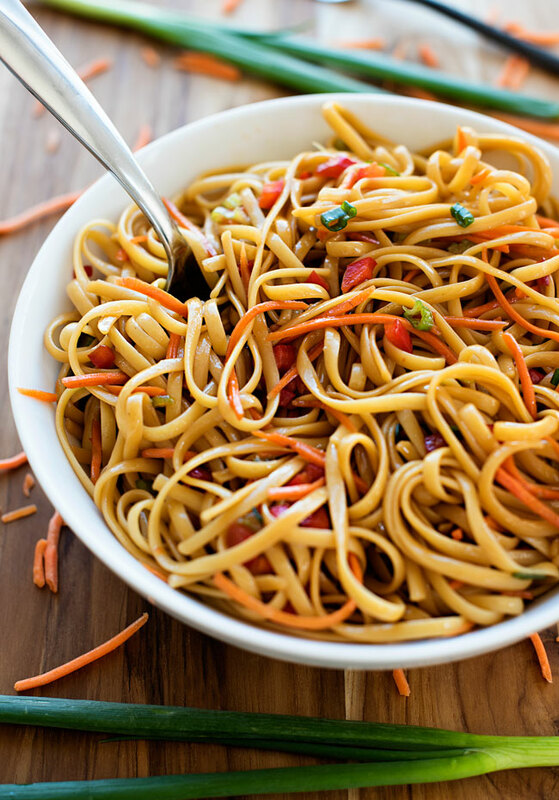 This Asian Pasta Salad is scrumptious. Many Asian salads are overpowered by the sesame oil, but not this one; the flavors are perfectly balanced. From now on I’ll be doubling the recipe so the food doesn’t disappear quite so fast! This is without a doubt the best pasta salad I have made. I found that the sauce supported 1# of linguini. I used the chili garlic sauce made by I think Shirachia. Just the right about of zing. Will be my go to summer salad. Dinner table of six, salad went around for seconds!